Believe it or not, a person could be criminally liable, meaning they could be convicted of a crime, if their dog attacks someone. Texas appellate courts have recently upheld Texas’ dog bite law, also known as Lillian’s Law. Therefore, it is important to be aware of what is required of you as a dog owner. 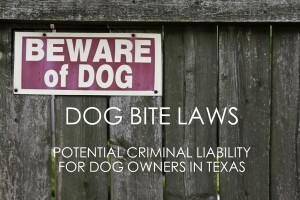 The article below outlines Texas law as it relates to dog owner responsibility. If you own a dog that has displayed dangerous tendencies, you should take a look. Can I be Convicted of a Crime in Texas if My Dog Attacks Someone? If they know their dog is a dangerous dog by receiving notice in a manner described in the Texas Health & Safety Code, and the dog, in a place other than the owner’s real property, boat, or motor vehicle, makes an unprovoked attack on another person that causes serious bodily injury or death. The offense is a third degree felony, which is punishable by 2-10 years in prison and a fine of up to $10,000. If the attack causes death, then it’s a second degree felony punishable by 2-20 years in prison and a fine of up to $10,000. How do I know if my dog is considered a “Dangerous Dog” under Texas law? Under the Texas Health and Safety Code, a “dangerous dog” is a dog that makes (1) an unprovoked attack on a person that causes bodily injury or death or (2) commits unprovoked acts leading a reasonable person to believe that the dog will attack them in a place other than an enclosure reasonably certain to prevent escape by the dog. What are my requirements if I know my dog is a “Dangerous Dog”? Comply with any local regulation, requirements, or restriction. In compliance with the enclosure requirements established by the local animal control. What Defenses are Available if I Have Been Charged With the Dog Bite Statute? The person is a veterinarian, veterinary clinic employee, a peace officer, employee of a recognized animal shelter, dog trainer/employee of a guard dog company, or a person employed by the state or the state’s political division to deal with stray animals AND has temporary ownership, custody, or control of the dog in connection with their position. The person is employed by the Texas Department of Criminal Justice or other law enforcement agency and is training or using the dog in connection at the time of the attack. The person has a disability, the dog is trained to provide assistance to a person with a disability, and the person is using the dog to provide assistance in connection with their disability. The person attacked was in the process of committing a homicide, kidnapping, trafficking of a person, sexual offense, assaultive offense, any property damage or destruction, robbery, burglary, or criminal trespass. At the time of attack, the dog was on a leash and the person was in immediate control of the dog OR if not, the person was making immediate and reasonable attempts to regain control. The person and the dog are participating in an organized search and rescue effort at the request of law enforcement. The person and the dog are participating in an organized dog show/event sponsored by a recognized kennel club. The person and the dog are participating in a lawful hunting activity or farming/ranching activity.